I too am new to astronomy and bought a 8″ Orion SkyQuest XT8. I’ve been playing around some old webcams but am only able to get an image using an eyepiece and leaving the lens on the webcam. Am I missing something here? I don’t see anyway its going to focus without an eyepiece. I can project an image on to a piece of paper but have had no luck projecting directly onto the camera chip without the lens. Any suggestions? In theory you should be able to use your webcam at “prime focus”, i.e. 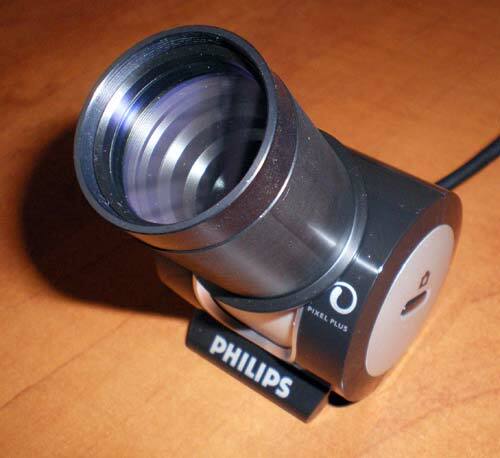 with no eyepiece, and with the webcams lens removed, but with a nosepiece adaptor attached (this is what I have). The nosepiece obviously gives the required 1.25inch fitting to go into the eyepiece holder, and it should also provide a screw fit for a UV/Infra-red filter to screw into (because usually the IR filter included as part of the webcam standard lens is not very good for astronomy). Also the interior of the nosepiece should be “baffled” (stepped) to reduce reflections. More importantly the nosepiece adaptor adds sufficient distance between the webcam and the eyepiece holder to achieve correct focusing. (The filter plays no part in focusing). You may need to search carefully for the correct nosepiece adaptor for your particular webcam, i.e. correct diameter and length of thread, to go into the webcam. The first adaptor I got was the wrong thread length! How far away do you have to hold the piece of paper? That should give the clue as to the required distance to form a focused image on the CCD chip (I guess you’re looking at something easy/obvious like the moon?). I believe you can also get extenders (basically a hollow tube used to push eyepieces, etc further out of the holder so they can achieve focus). As an example I also have a 2inch SWA (super wide angle) eyepiece but I have to pull it slightly out of the holder before tightening it in place so that I get a full focusing range, i.e. blurred, then into sharp focus, then beyond out of focus again. See the photos I have attached of my webcam which is a Philips SPC900NC. And also this experimental first-time shot of Saturn from an AVI movie, taken with the webcam, then stacked/processed using K3CCDTools (or Registax). I’m very pleased considering this is my very first attempt with the webcam and the software…. Thanks for the info, you were a huge help. After reading your e-mail it dawned on me that I wasn’t having focusing problem but a camera problem. The driver I was using only allowed for brightness and contrast adjustments. I found a better driver than allowed control of the gain, exposure, and color saturation. I was severely saturating the imaging chip. I taped my camera (very old QuickCam) directly to a 2x barlow and got a nice picture. Thanks again. Good! Glad you got it sussed. 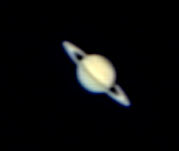 Saturn is awesome and I love being able to see her moons too with the XT10. I guess you too can probably see them on a good night with your XT8? Those shots I sent you were very basic 20-30 second AVI’s. It’s amazing what K3CCDTools or Registax can do. As you can see from my photo of Saturn plus her moons, the webcam gain/exposure settings and hence the main planet is very over-exposed in order for the moons to show too. The shot is not very well focused (with my eye the image is much sharper), but this might again be a result of over-exposing. 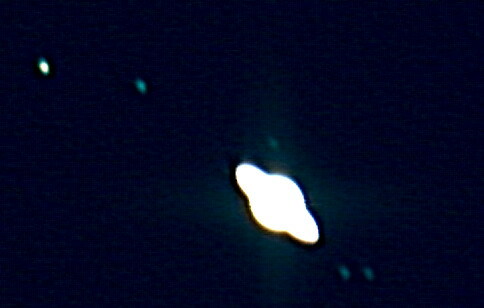 Anyway the main point is it demonstrates that you can achieve some interesting shots even without equatorial tracking. I suggest you checkout K3CCDTools some time to allow good control over your webcam, although the main drivers are obviously the important part. 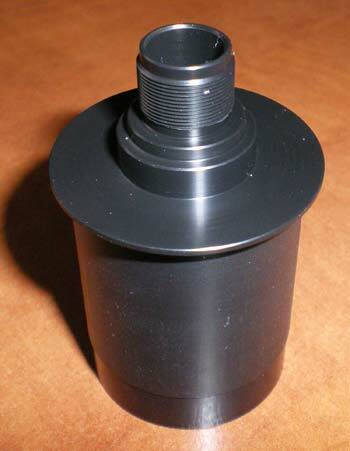 Do you think you can get a nosepiece adaptor for yours? It will allow a much quicker/more reliable method than tape! Now that I know it all works on my telescope I will most likely be getting a new camera. Our local Wal-Mart caries the SPC900NC/27. In the store its $75 but on line its $58.88 and they will send it to the store for free and not charge sales tax. Makes no sense to me. I’ve played around with Registax and will definitely look into K3CCDTools. Thanks again, Mike. This entry was posted on Tuesday, June 17th, 2008 at 10:22 pm	and is filed under Astrophotography. You can follow any responses to this entry through the RSS 2.0 feed. You can leave a response, or trackback from your own site. Appreciate you information. My buddy advice to visit you. Intresting. Subscribed! Want to visit your site again! Very interesting, I am having problems finding the right distance between the CCD and the focal point (with the webcam lens removed). I read 40mm somewhere so I’m improvising different spacers at the moment! Thanks once again. Spam protection: Sum of five + six ?